We’d love your help. Let us know what’s wrong with this preview of Black Creek by Gregory Lamberson. In 1979, the US government relocated more than eight hundred families from Love Canal, New York, after decades of toxic contamination. Not all of the residents left: some remained in their homes on the outskirts of the disaster area. Others went underground. Hiding. Changing. Breeding. Almost four decades later, Love Canal has been renamed Black Creek Village and restored f In 1979, the US government relocated more than eight hundred families from Love Canal, New York, after decades of toxic contamination. Not all of the residents left: some remained in their homes on the outskirts of the disaster area. Others went underground. Hiding. Changing. Breeding. Almost four decades later, Love Canal has been renamed Black Creek Village and restored for inhabitation. The residents there and on neighboring Cayuga Island remember the tragedy of Love Canal but have no knowledge of the monsters living below the surface. When the worst snowstorm in forty years isolates all of western New York, the forgotten inhabitants of Love Canal emerge from hiding to reclaim what once belonged to them. To ask other readers questions about Black Creek, please sign up. I had a bit of a reading slump the other day, and I needed to read something that was not too heavy, something that would entertain me. Some people may go for a chick-lit or perhaps a cozy mystery book. I choose a monster book. I just know that it will take away the funk I'm in. Sure a cozy mystery could probably help also, but sometimes I just love to get lost in a really gruesome monster book. And I was really lucky because BLACK CREEK is really good. This is the first book I have read by Greg I had a bit of a reading slump the other day, and I needed to read something that was not too heavy, something that would entertain me. Some people may go for a chick-lit or perhaps a cozy mystery book. I choose a monster book. I just know that it will take away the funk I'm in. Sure a cozy mystery could probably help also, but sometimes I just love to get lost in a really gruesome monster book. And I was really lucky because BLACK CREEK is really good. This is the first book I have read by Gregory Lamberson, and I'm impressed because he managed to write a truly disturbing story. 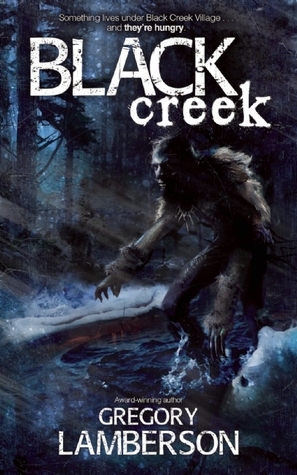 While the main plot - mutants created by toxic waste - is not really new, the setting of 'Black Creek' during a whiteout blizzard was scary as hell. For a long part of the story, the snow storm is the only enemy the people living in the Black Creek area have to face, and it's a really mean one. The author did a great job bringing it to live, making me shiver to the bone just reading about and imagining it. The invasion of the long forgotten underground inhabitants seemed just like the icing on th While the main plot - mutants created by toxic waste - is not really new, the setting of 'Black Creek' during a whiteout blizzard was scary as hell. For a long part of the story, the snow storm is the only enemy the people living in the Black Creek area have to face, and it's a really mean one. The author did a great job bringing it to live, making me shiver to the bone just reading about and imagining it. The invasion of the long forgotten underground inhabitants seemed just like the icing on the cake, so to speak, adding another layer of horror to make this book a perfect read. But the real horror definitely was the snow blizzard - without it this would have been just another variation of the mutant creature theme, something like Silent Hill during bad weather. The author did a great job bringing his characters to life and creating an ever-present intimidating atmosphere that doesn't allow anyone to take a breath, not even the reader. I recommend reading this not only with the lights on, but the thermostat as well. An exciting horror story that combines the fears of being trapped in a whiteout blizzard and being hunted by cannibal mutants. The most imaginative take yet on what the Love Canal disaster might have spawned. There were a lot of different characters, but the story line kept them in your mind so it was easy to remember who was who. This is the kind of genre of book that I read quite often. I thought he did a very good job with keeping it moving while throwing in some things that made you wonder if that was really what you read and happened. The only part I didn't enjoy was when the book came to an end. I thought it was too quick of an ending. I wanted more. Maybe Mr. Lamberson will c I enjoyed this book! The only part I didn't enjoy was when the book came to an end. I thought it was too quick of an ending. I wanted more. Maybe Mr. Lamberson will come out with a sequel to this. Entertaining story, but weirdly paced. First 2/3 were slow and the last bit was like out of an action movie. For decades, hundreds of families lived above a toxic waste dump in a place called Love Canal, New York. There were reports of birth defects, cancer, and deaths. In 1979, the United States government finally relocated over eight hundred families. However, not all the residents left. Some remained in their homes just outside the disaster area. Others went underground. They hid from the authorities. They breed. And they mutated. Forty year This review was first published on Kurt's Frontier. Forty years after the evacuation, Love Canal has been restored. Renamed Black Creek, the people in the region remember the tragedy. However, they are unaware of the monsters living under Black Creek, descended from those who did not leave. When the worst storm in four decades isolates western New York, this forgotten tribe emerges to hunt and reclaim what was once theirs. They have also developed a taste for human flesh. Gregory Lamberson’s story had a special appeal to me. I lived in western New York when I was working on my Ph.D. Though I didn’t often travel far past North Tonawanda, I recognized many of the places. Paul Goodman and his family have been living on Cayuga Island, a short way from Black Creek. In the opening chapters, people begin noticing strange things. Paul’s son, Evan has a friend who saw a strange, man-like creature in the woods. The boy begins displaying signs of post-traumatic stress. In February, three major storms converge on western New York. (I still remember lake effect snow.) Snow piles up fast and the monsters come out of hiding. I really enjoyed the majority of this book, but the ending definitely lowered the amount of stars I was planning on giving it. I felt like the ending came on much too fast. A creature that had been hinted at a few chapters earlier is introduced and dealt with in a way that left a lot more questions than it resolved. I thought the character development was great and the overall story idea was riveting (I had done a driveby of the Love Canal site the day before discovering this book). It was only t I really enjoyed the majority of this book, but the ending definitely lowered the amount of stars I was planning on giving it. I felt like the ending came on much too fast. A creature that had been hinted at a few chapters earlier is introduced and dealt with in a way that left a lot more questions than it resolved. I thought the character development was great and the overall story idea was riveting (I had done a driveby of the Love Canal site the day before discovering this book). It was only the ending (specifically the next to last chapter) that I found disappointing. A very enjoyable read. Fast paced and thrilling. However, the idea that the story is about inbred cannibals feels slightly misleading. The majority of the story is taken up in surviving the harsh and dangerous winter storms. The cannibals play second tune until the very last part of the book. I enjoyed the survival aspect, but found the tone of the book shifted from thriller to horror at the end. Gregory Lamberson likes horror movies. No, I mean, he really likes horror movies. It’s no coincidence then that the award-winning director of cult-favorite films like Slime City and Killer Rack wears his cinematic B-movie influences proudly in is latest novel, Black Creek. For the residents populating Lamberson’s version of Black Creek Village – the real-life Niagara Falls neighborhood that sits atop the infamous Love Canal, in which 22,000 barrels of toxic waste were dumped in the late 1970’s cau Gregory Lamberson likes horror movies. No, I mean, he really likes horror movies. For the residents populating Lamberson’s version of Black Creek Village – the real-life Niagara Falls neighborhood that sits atop the infamous Love Canal, in which 22,000 barrels of toxic waste were dumped in the late 1970’s causing widespread health problems and population displacement – there is less love in the air this Valentine’s Day than there is snow and blood. Lots of snow, lots of blood. The story has a slow build in the first couple of chapters, and Lamberson uses this time to flesh out the characters, their past, and the area they are living in. The characters feel very real, and it's easy to grow attached to them. With that being said, this is a horror novel meaning anyone and anything is fair game to be a target. The action and terror were intense, and I enjoyed all the twists and turns in this novel. At times it felt like I was in a horror movie. Looking forward to reading The story has a slow build in the first couple of chapters, and Lamberson uses this time to flesh out the characters, their past, and the area they are living in. The characters feel very real, and it's easy to grow attached to them. With that being said, this is a horror novel meaning anyone and anything is fair game to be a target. Gregory Lamberson is an author and filmmaker who specializes in horror entertainment. He is a two-time winner of the IPPY Gold Medal for Horror and a three-time Bram Stoker Award finalist. A motion picture based on his award-winning novel JOHNNY GRUESOME will be completed and released in 2017,. Fangoria magazine called him "the hardest working man in horror." Lamberson is the author of the six-nove Gregory Lamberson is an author and filmmaker who specializes in horror entertainment. He is a two-time winner of the IPPY Gold Medal for Horror and a three-time Bram Stoker Award finalist. A motion picture based on his award-winning novel JOHNNY GRUESOME will be completed and released in 2017,. Fangoria magazine called him "the hardest working man in horror." Lamberson is the author of the six-novel occult detective series The Jake Helman Files (PERSONAL DEMONS, DESPERATE SOULS, COSMIC FORCES, TORTURED SPIRITS, STORM DEMON and HUMAN MONSTERS), the werewolf trilogy The Frenzy Cycle (THE FRENZY WAY, THE FRENZY WAR and THE FRENZY WOLVES). In addition to GRUESOME, his stand alone works include BLACK CREEK, THE JULIAN YEAR, the zombie novella CARNAGE ROAD, and the instructional filmmaking book CHEAP SCARES: LOW BUDGET HORROR FILMMAKERS SHARE THEIR SECRETS. In 2016, Lamberson directed a feature length movie version of JOHNNY GRUESOME, currently in post-production. He previously directed the cult films SLIME CITY, SLIME CITY MASSACRE and KILLER RACK. He is currently hard at work developing his literary properties as films and TV series.